Rough gears (again) 4th of 7 speed rear. Suntour! I've ploughed through a lot of a previous thread on rough gears, which was interesting. I've just cleaned up the transmission on my old war horse and fitted a new chain. This is a steel (no suspension either end) mountain bike of around 1995 vintage. Everything seems to be running smoothly except for the middle gear (4) at the rear. This is being all rough and skippy (for want of a better description) although all the other gears change in and out fine. I read up on adjusting the cable tension, but it seems you adjust using one-from-smallest (6 in my case) and that gear seems fine. Is this potentially new chain/old sprockets? In which case will a few trips out settle it down? It is a long time since I can remember changing the rear cassette so it could well be worn (other thread someone mentioned 3 chains to a cassette which seems to assume that the cassette is just another consumable). If it does need replacing then this prompts the question - how easy is it to replace? The cassette is a 13/32. Uh-oh. Checking the lock ring and it says Suntour Powerflo and the biggest ring has PF-32T-A stamped on it. Rear mech and front shifters are Shimano Alivio. Front mech is Shimano but no further information visible. So, what is my best option if I have a worn Suntour cassette? I have long ago memories about breaking the rear axle and having the option to have a Shimano hub instead of duplicating the original setup but that was probably 15 years or more ago. Do I have to strip it down to work out what is underneath? Is it feasible that this is a Suntour cassette on a Shimano hub? I am reluctant to replace the rear wheel in total because the hub seems so good - at least, I've noticed that the bike, when freewheeling down a hill with a group of other bikes, seems to gradually go a little bit faster which I attribute to a lower rolling resistance. Which given the large tyres is quite impressive. Re: Rough gears (again) 4th of 7 speed rear. Suntour! 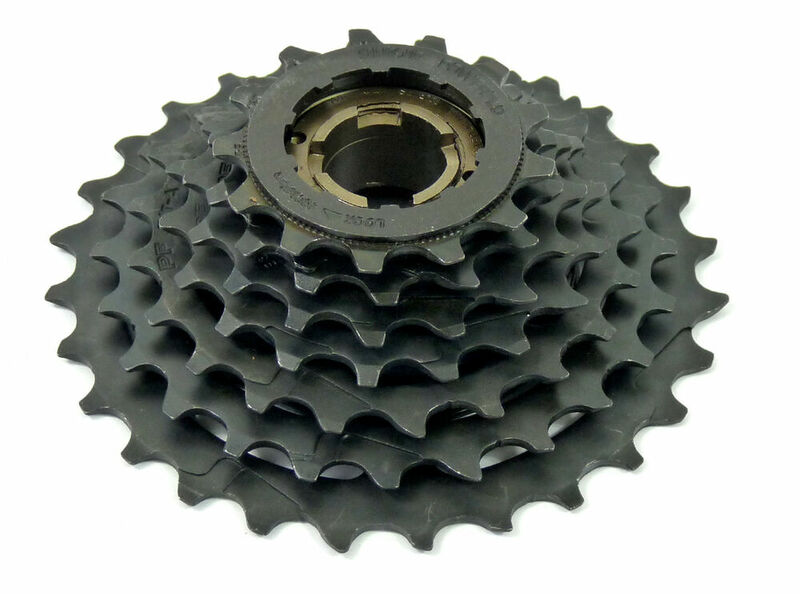 If the chain skips on that one sprocket when you push hard, and feels rough the rest of the time on that one sprocket, then it could mean that sprocket is particularly worn. It may well settle down after a bit of use, as the chain wears to match the worn sprocket. However, if you do need a new cassette, its my recollection that Shimano and Suntour* are interchangeable.....same spline on the hub, same sprocket spacing. Agree with 531 Colin, though I suspect its a given that 4th is much used, so worn, so you will need a new cassette. However, if the rear wheel is original 1995, the splines will be different from Shimano, and you almost certainly won't get a Suntour (or any other) cassette to fit. Modern Suntour cassettes will be Shimano compatible. If the cassette says Powerflow on them, that will probably date them (ie either modern or 1995). Alas, someone else will need to come along and say if Powerflow is modern or mid 1990's. If you took up the option of a Shimano hub 15 years ago, then any 7 speed cassette should fit. I think the wheel may have been rebuilt with a Shimano hub. I assume that I'd have to take the cassette off to confirm this. Depending on what was done it is always possible that this is the original cassette assuming that the Sutour hub was replaced with a Shimano hub but the cassette was interchangeable. I do wish I could remember when I broke the rear axle. Certainly not recently. Can you replace individual gears in a rear cassette? I wouldn't mind having a slightly higher top gear, perhaps an 11 instead of a 13. A Suntour Powerflo cassette from the mid 90's cannot fit a Shimano hub - as mentioned above the splines are different, spacing is apparently close enough for Shimano RD indexing to work - I've never tried this as I am running a complete XC Pro 8 speed drivetrain. I think for Accushift indexing is keyed to the smallest cassette sprocket, the guide pulley directly in line - perhaps you should try this to see if it makes a difference. Suntour cassettes are out there - not many. This looks a likely candidate https://www.ebay.co.uk/itm/SR-Suntor-7- ... SwmqZav3fZ. Edit looking at this ebay cassette I wonder whether it is fact a modern Shimano compatible one in the which case it will not fit your hub. Yes it is Shimano compatible, not suitable . A pity. It is a long time since I last used an early-mid 90's Suntour cassette hub and held one in my hands. However IIRC on a seven speed the top sprocket was threaded, similar to Uniglide. The old stuff is not compatible with Shimano. The OP's picture shows a retaining ring, Hyperglide style. I expect that to be a current Suntour cassette which I believe to be Shimano compatible. Yes you are right I should have looked more closely at the OP's photo - it must be a Shimano hub , so no problem to to swap out for something else. Suntour should have been left to lie in peace after its demise. LittleGreyCat wrote: Can you replace individual gears in a rear cassette? It's possible, but in your case, as it seems very likely the whole cassette is worn, I'd just get a new cassette. This is simpler and not much more expensive (even if you managed to find a suitable 11t single cog somewhere). Online you can get a Shimano CS-HG41 (11-28t) for £12.00, or a SRAM PG730 (12-32t) for £10.00. As far as I know, all Shimano-compatible 7-sp cassettes have the same spacing. Someone will correct me if I'm wrong about that. the thing that looks like a lockring is a lockring, but it just holds the sprockets onto the freewheel body. I think your freewheel uses a two-dog remover, not a four-dog remover as per the picture above. The lockring uses an unusual spline; it only needs to be undone if you are to disassemble the freewheel body or remove the sprockets. Easiest option is to remove the freewheel and to replace it with another 7s freewheel. I would be rather surprised if there wasn't some sort of branding on the hub, but then as its a screw-on hub, it doesn't matter anyway. Brucey wrote: I think that your 'cassette' is actually an unusual style of Sun Tour screw-on freewheel, ... I think your freewheel uses a two-dog remover, not a four-dog remover as per the picture above. Suntour abandoned two dog freewheels in the 80's. I still think it's a Suntour cassette. As usual, in awe of the information flowing my way. If I manage to remove the coggy things, will there be some kind of branding on the internal bits? I will need some courage pills because previous experience suggests that disassembly always brings more problems than first expected. Just looked at the picture and it does look very familiar. A 12/32 would do me nicely as well. I think I may have to take the bits off to confirm (gulp). LittleGreyCat wrote: If I manage to remove the coggy things, will there be some kind of branding on the internal bits? There may be some branding or model numbers on the hub shell, if they're anything like mine these may be hidden beneath grime. LittleGreyCat wrote: I will need some courage pills because previous experience suggests that disassembly always brings more problems than first expected. ParkTool have some pointers if you're unsure what to do.